Yoga teaches us to surf the waves of life—joy, grief, sorrow, passion, lightness, peace—and integrate all the layers of who you are. Give yourself permission to explore your edge and let go of expectations to look or be a certain way. The true beauty of yoga is how it imbues all aspects of life. Don’t forget about the transitions and the middles. The space in between postures can be just as powerful as the postures themselves. On the mat and in life, we tend to find transitions uncomfortable—whether it’s between poses, jobs, relationships, or stages in life. By watching the breath and practicing mindfulness, we can embrace the places in between with grace and awareness. Being in the middle of a posture (or job, relationship, or phase of life) can also be challenging: Holding the pose instead of rushing into the next thing requires commitment and focus. Can you honor the evolution, and engage with every moment of the journey? Listen closely to what you need. If your tendency is to push yourself and sacrifice self-care, then Child’s pose might be the most courageous and challenging posture for you. If you tend to withdraw when life—and yoga—gets hot, you might want to experiment with staying with it to see how that feels. Everyone’s edge is different. In life and on the mat, we can make continual readjustments, fine-tuning to discover what makes us feel most alive. Connect to the rhythms of nature. A yoga class is like a microcosm of the seasons and of the cycle of life: We begin by warming up and planting new seeds; we blossom and fully express ourselves in the heat of the practice; we cool down and prepare for going inward; and, finally, we move into stillness in Savasana, or Corpse pose. When we surrender into the flow, our bodies, hearts, and minds learn to trust the rhythms of nature that ultimately guide our lives. Access your creativity. Life isn’t predictable, and a vinyasa class shouldn’t be either. I like to take people on an unexpected journey, one in which they can let go of habitual ways of moving and being and explore the infinite possibilities available to them. The creative force of the universe is all around and within us; when we tap into it, we can bring forth our unique gift and offer it in service to the world. 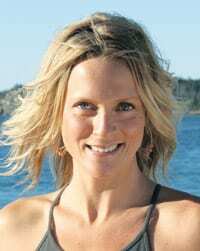 Coby Kozlowski, MA, E-RYT, is a faculty member at Kripalu Center for Yoga & Health, where she directs teacher trainings and teaches her program Quarter-Life Calling: Creating an Extraordinary Life in Your 20s. Coby is the founder of Souluna Life Coach Certification™ training and Karma Yoga Leadership Intensive: A One-Degree Revolution.